We recently switched to a new VPN server after Mac OS dropped support for PPTP and because we were way overdue to do it anyway. Since then personal computers were unable to access network shares via DFS. They could go directly to the file server and that would work. Users who connected to VPN with a organization owned laptops were able to use DFS. Unfortunately I didn’t have the time to implement this. This is a crappy hacky work around that isn’t really sustainable but will work for now until we can sit down and plan changing our DFS over to use DNS only. Domain Computers worked fine because we use group policy to push out multiple DNS search suffixes. DHCP doesn’t allow you to do this with Windows PCs so when they try to lookup ‘fileserver1’ they would try to hit WINS if implemented and then append their DNS suffix (vpn.mydomain.com) and then fail to find the file server resulting in a “Network Path Not Found” errors. Posted in Active Directory, DFS, DNS, Microsoft, Networking, VPN, Windows Server, WINS. We’ve just finished migrating all of our users from a legacy AD forest with Exchange 2010 into a whole new AD forest with Exchange 2016. During the initial deployment of Exchange 2016 a new mailbox store was created, the existing system mailboxes were migrated (mailbox move) to the new store and the default Exchange 2016 store was deleted. We think our OAB broke at this point. 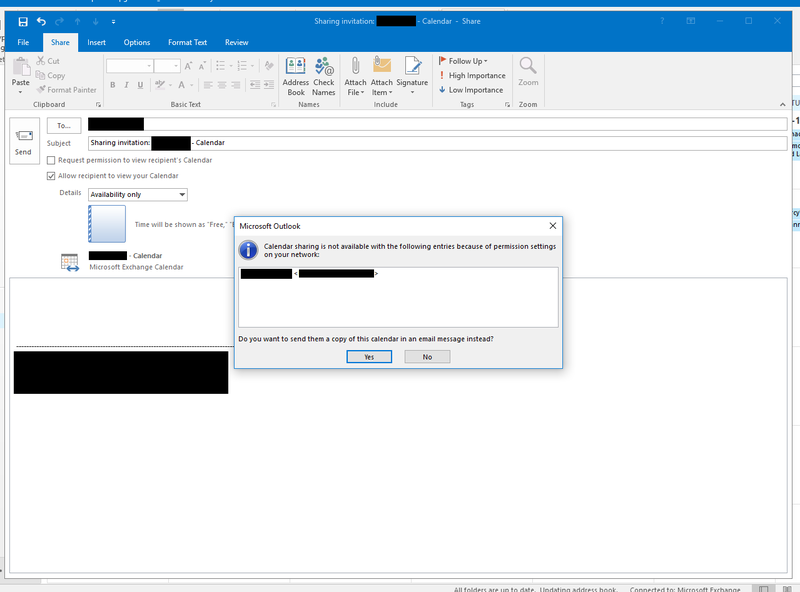 The behavior we were seeing was Outlook clients perpetually saying “Updating Address Book”, slow performance in Outlook where previously there wasn’t, delayed e-mail coming into mailboxes. 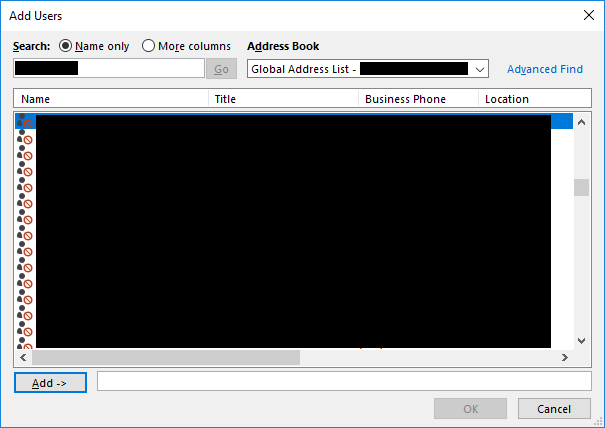 If users went into “C:\Users\%username%\AppData\Local\Microsoft\Outlook\Offline Address Books” they either had nothing or a old copy from our previous Exchange 2010 deployment. If they closed Outlook, purged the contents of “Offline Address Books” they would never be re-created because the OAB would never download from Exchange. I’m assuming you’ve got everything else configured correctly on your end at this point. Things like Internal/External URLs, SSL certificates, yadda. As you can see this OAB has never been touched which means to me it’s never been updated or created. The permissions were incorrect on our web.config file so I tried the suggested fix in the blog post. It didn’t work. I then went through this document: https://technet.microsoft.com/en-us/library/gg247612%28v=exchg.150%29.aspx and made all of the tweaks needed to match those recommendations. I couldn’t find a Exchange 2016 specific document but there weren’t many tweaks to be made and they all made sense to me. This did not resolve the issue either. Error : System.Net.WebException: The remote server returned an error: (500) Internal Server Error. Verbose : [2017-07-19 20:51:57Z] Offline Address Book connecting to 'https://*****************/OAB/28a57cb5-b2c8-442a-81f3-a48a05f9ab7b/oab.xml'. Ok. Error 500. We know this already. ERROR CODE: 0x801901f4 - HTTP status 500: An unexpected condition prevented the server from fulfilling the request. This confirmed for me that the OAB wasn’t even being generated. We then tried manually updating the OAB. The command succeeded but no OAB was generated. We think what happened is the moving of the System Mailboxes way back at the beginning of our Exchange 2016 deployment broke the association of which system mailbox generates the OAB. It took all of 30 seconds and then the OAB URLs started working again and displaying a properly formatted XML file. Outlook clients automatically started downloading the OAB with no issues. The LastTouchedTime was now set. I’ll be checking again tomorrow to make sure the LastTouchedTime changes based on the Schedule. Verbose : [2017-07-20 17:52:34Z] Offline Address Book connecting to 'https://******************/OAB/28a57cb5-b2c8-442a-81f3-a48a05f9ab7b/oab.xml'. Generation of OAB "\Default Offline Address Book" started. Generation of OAB "\Default Offline Address Book" completed. Posted in Exchange 2016, Microsoft, Powershell, Windows 2012 R2, Windows Server. Our AD structure contains three domains, one root domain (int.mydom.com) and two sub-domains, one for servers/services (it.int.mydom.com) and one for user accounts (users.int.mydom.com). We are running into problems with NetApp Single Mailbox Recovery where it is unable to connect to the target mailbox for drag/drop restores. In the mean time we’re just exporting PST files and letting the user do the work. We started with SMR 7.1 where you could specify connecting to all Exchange mailboxes instead of an individual users mailbox. We found we had to change the domain controller SMR was using to find the mailboxes to one of the users.int.mydom.com DCs. By default SMR would select a DC in it.int.mydom.com where Exchange and our privileged IT accounts are. We’re running Exchange 2016 so there were other issues when trying to do a drag/drop restore so we had to upgrade to SMR 7.2 which added support for Exchange 2016. SMR 7.2 removed the ability to open all mailboxes and specify a domain controller so we’re stuck again. Please note that after checking with additional resources from SnapManager for Exchange we confirm there is a known issue with this function, there will be changes to this in the next version of SMBR, the Next SMBR release and version 7.2.1 should come soon but I am afraid at this point there is no a workaround we can follow. If you’re really desperate for drag/drop and have an environment like ours you might be able to create privileged accounts in users.int.mydom.com and use them for the restores. That might work. Posted in Exchange 2016, Microsoft, NetApp, Windows 2012 R2, Windows Server. We just recently went through an AD forest migration AND an Exchange 2010 -> 2016 migration across forests at the same time. Good times. 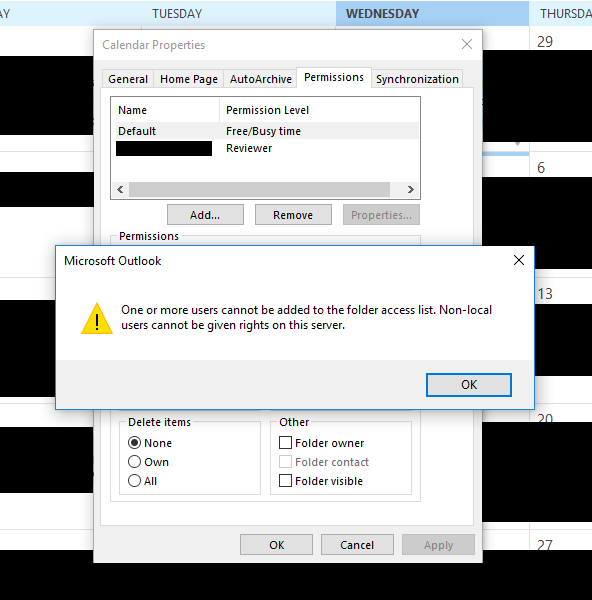 One of the many issues that came up after the migration was the majority of our users being unable to share their calender’s with other users. Set-Mailbox -Identity <USERNAME2> -Type Regular -DomainController <DC FQDN> WARNING: Couldn't convert the mailbox because the mailbox "USERNAME2" is already of the type "Regular". WARNING: Couldn't convert the mailbox because the mailbox "USERNAME2" is already of the type "Regular". Despite that warning message this users mailbox was now fixed after the user closed/re-opened Outlook. Set-Mailbox -Identity <USERNAME2> -Type Regular -DomainController <DC FQDN> WARNING: Couldn't convert the mailbox because the mailbox "USERNAME2" is already of the type "Regular". WARNING: The command completed successfully but no settings of '<DOMAIN FQDN>/User Accounts/Staff/USERNAME2' have been modified. Why didn’t I get that second warning about not making any changes the first time I ran it? Simple. It’s because something was changed and Microsoft doesn’t think I need to know that. Digging into the account attributes I figured out what changed. It’s called ‘msExchRecipientDisplayType’ and was introduced in Exchange 2007. This attribute determines what kind of recipient the mailbox is in the Address Book. Pre-AD Migration msExchRecipientDisplayType was set to 1073741824 which is a “ACL able Mailbox User”. Post-AD Migration msExchRecipientDisplayType was set to 0 which is a “Mailbox User”. Makes sense now why you can’t apply permissions (ACL) on a “Mailbox User” when a “ACL able Mailbox User” user type exists. We used Microsoft’s own tools (ADMT, Exchange 2016) to migrate our users from one forest and Exchange to another. Some where in that migration the attribute was wiped out and not transferred on 2941 out of 3123 mailboxes. Our environment is a mix of Shared, User, Resource and Equipment Mailboxes. There were affected accounts in all four categories. If we did a simple script that looked for “msExchRecipientDisplayType=0” and changed it to “1073741824” we might end up with the wrong value for a mailbox depending on what type it’s supposed to be. Based on my reading msExchRecipientDisplayType should be 1073741824 for Shared and User mailboxes, 7 for a Room Mailbox and 8 for a Equipment Mailbox. These commands together fixed 2890 of 2941 broken mailboxes. This corrected the account. No idea why the batch command didn’t. I ran this command for all of the regular mailboxes that didn’t fix in the batch and it worked fine. That left me with a bunch of shared mailboxes that were still broken and one user account that would not fix. I checked one of the problematic accounts in ADSIEdit.msc and it had the correct msExchRecipientDisplayType value of 1073741824 despite PowerShell telling me it was set to 0. Since there were only 23 accounts left that were problematic I used ADSIEdit to verify and fix the remainders. Choose Yes to confirm you want to empty the list. Posted in Active Directory, Exchange 2010, Exchange 2016, Microsoft, Windows 2012 R2, Windows Server.